The United States Congress designated the Cohutta Wilderness (map) in 1975 and it now has a total of 37,033 acres. Georgia contains approximately 35,287 acres. Tennessee contains approximately 1,746 acres. It is managed by the Forest Service. The Cohutta Wilderness is bordered by the Big Frog Wilderness to the northeast. Most of mountainous Cohutta, the state's second largest Wilderness, lies in Georgia and within the Cohutta Wildlife Management Area. But a small portion runs over the border into Tennessee. Immediately northeast of Tennessee's portion, and sharing a border, lies Big Frog Wilderness. Although loggers worked their way through 70 percent of the forest between 1915 and 1930, oak and pine have all but reclaimed the forest, and a rich growth of hardwoods now fills out the lower elevations: magnolia, maple, buckeye, hornbeam, sassafras, holly, silver bell dogwood, and chestnut, to name but a few. Spring and summer bring a riot of colorful blooms to many shrubs, vines, and herbaceous plants, ranging from the brilliant orange of flame azalea to the pink and yellow of lady's slippers, the blue cohosh, and the scarlet cardinal flower. But summer also means heat and high humidity, biting insects, and foliage so dense it blocks some views that are truly spectacular in fall and spring. 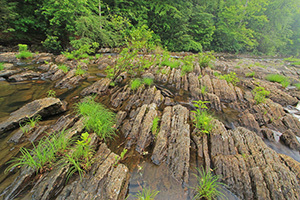 The Conasauga and Jacks Rivers, two of the state's most prolific trout streams, drop through rocky gorges and flash flood the Wilderness during periods of heavy rain. Anglers can try hooking trout in the many streams, too, while hunters train their sights on white-tailed deer, black bears, and wild boars. More than 100 bird species have been identified in the area (situated along the Appalachian Flyway), along with copperheads, timber rattlesnakes, and other slithering species. Popular trails follow both the Conasauga and Jacks Rivers, and at least a dozen other footpaths provide access to the Wilderness. Many of the trails require wading through waterways. The 15.7-mile Jacks River Trail, for instance, passes through water no less than 40 times. Planning to Visit the Cohutta Wilderness? How to follow the seven standard Leave No Trace principles differs in different parts of the country (desert vs. Rocky Mountains). Click on any of the principles listed below to learn more about how they apply in the Cohutta Wilderness.